Home › News › Uncategorized › What message are we sending to our children? This photograph really gets to the heart of the problems created by felling street trees. It might be hard to understand, but for some the loss of a tree is an emotional blow that is simply too much to bear. How do you explain to a three-year old that the perfectly healthy tree outside their home has to go? On what planet does this make sense? A cynic might argue that this particular child has been influenced by his family, who are obviously well disposed to living in close proximity with trees, and that someone so young is not capable of forming their own opinions. 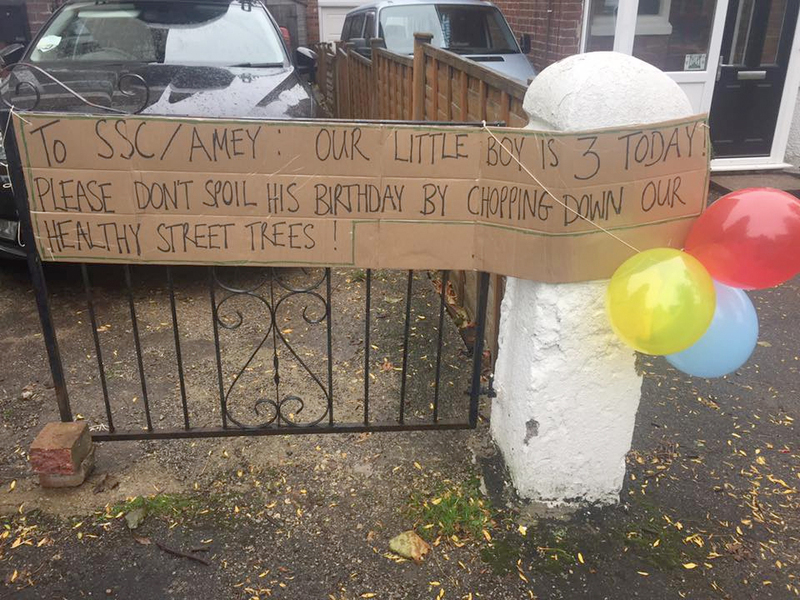 This, however, makes a mockery of the narrative we are told on a daily basis: ‘children are our future’, but what kind of future will they inherit if their parents are indifferent to the benefits of living next to trees? It is possible that the same parents who encourage their kids to play in parks or visit woodlands are only too happy for a mature street to be felled outside their home because falling leaves are a nuisance. Felling is a permanent solution to this temporary problem, and supporting it sends a very mixed-message to young minds. As soon as they can speak our children should be demanding the right to live in a world where trees are regarded with the status they so richly deserve. For a child it is simple: trees are a force for good. It is only with age and layers of bureaucracy that this ideal becomes clouded. 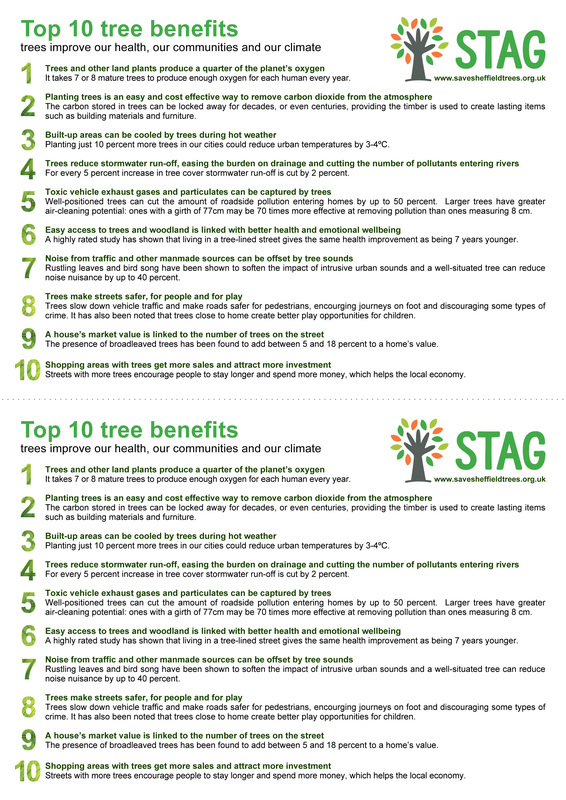 From Government right down to the Local Authority level there is broad agreement: we need more trees, not less. As cities grow to swallow up the land once occupied by fields and woodland where are the trees, and the animals that rely on them, supposed to live? A few months ago I had an illuminating conversation with an anti-tree resident on a Sheffield street. He maintained that trees did not belong on a city street because they are ‘unsafe’ and when asked where trees should be he replied: ‘Anywhere but here’, indicating a stronger case of biophobia than I thought possible. Is the blueprint we have so far adopted for our towns and cities so etched into peoples’ consciousness that they only recognise the mundane regularity of tarmac and concrete as the appropriate design for urban environments? What would it take for the average person to accept that we are already living in an ‘urban forest’, albeit one that is highly fragmented. Efforts to create new urban woodland are to be celebrated, but without clear connections with other tree-lined routes animals struggle to navigate our built-up environments. The ‘replacement’ trees currently being planted on our streets are either often too small or planted at too great a distance from one another to provide anything like the canopy cover required to act as ‘green corridors’. If nature is so inconvenient that it must be pushed to the edges of human dominated spaces in order to be acceptable, what happens when the all these edges merge into one? This is no idle hypothetical question; the Green Belts that have prevented urban sprawl are losing their protections and the UK’s woodland cover will be diminished. As the land woodland occupies is squeezed from all directions will we finally realise that the only place for trees is the city, because cities are all we have left? If future generations of children are forced to bear the negative physical and emotional effects of a nature-impoverished landscape who will they hold responsible other than the parents who failed to halt the destruction.